On Monday 5 November NEGS staff and students will host a ‘turning of the first sod’ ceremony by David Thompson, CEO Hockey NSW, to officially announce the NEGS Regional Sporting Complex, a new $1.5 million multi-purpose facility that will benefit not only the students but the entire New England community. 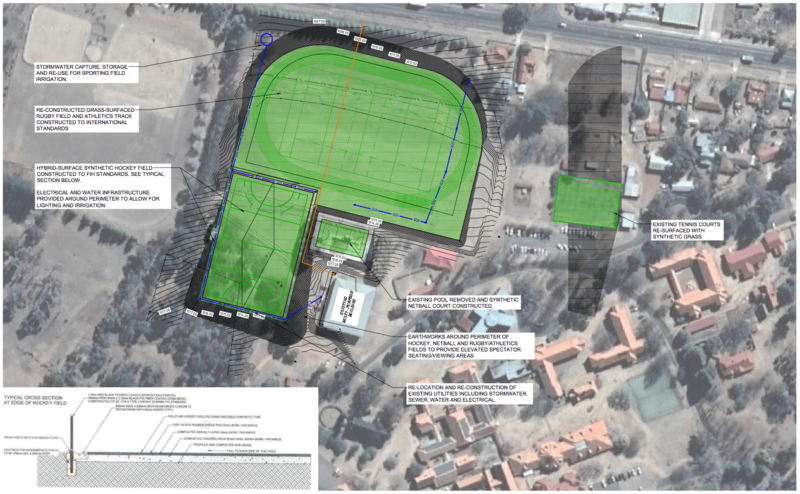 The Sporting Complex, which is funded through philanthropic donations to the School, will be among the best multi-sport venues in the region, providing NEGS athletes a state-of-the-art facility for daily training and competition. Signalling the dawn of a new era for NEGS sport, the complex will be anchored by a state-of-the art synthetic hockey field built to Federation of International Hockey (FIH) Standards, a rugby field, athletics track, nine netball courts and two tennis courts resurfaced with artificial turf. The Complex marks the most ambitious infrastructure project at NEGS to date, coinciding with three major player pathway programs supported by sporting bodies including NSW Rugby, Hockey NSW, Netball NSW and the UNE Lions. NEGS Principal Mrs Mary Anne Evans believes it will be one of the most exciting sporting projects that the school has experienced in its 124-year history. “It is a great honour to be able to share with you today this significant moment as we turn the first sod and officially launch the NEGS Regional Sporting Complex. This will be a truly a remarkable facility and will positively impact every single student, current and future when we deliver one of the best training and competition venues in the region. Our aim is to develop players into top-level athletes and ensure our players have the same opportunities as those living in metropolitan areas”, Mrs Evans concluded. The Armidale community will also benefit as NEGS Regional Sporting Complex will be available for external training, sporting camps and competitions. Georgie Robertson, The Regional PR Co.